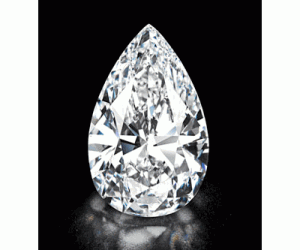 British auctioneer Christie’s sold a “perfect” pear-shaped colourless diamond for $26.7 million at an auction in Geneva Wednesday, reports the Associated Press. The symmetrical flawless gem weighs 101.73 carats and is graded with the best colour, D, the best clarity, flawless, and the best purity, Type IIa. The sale established a new world record price for a gem of its sort.